Black Friday and Cyber Monday are two of the busiest days for small businesses. Whether you have an e-commerce site or a brick-and-mortar business you should be prepared for the increase in traffic and convert visitors to customers. 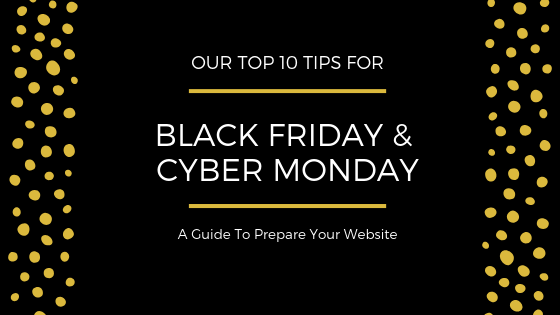 With such an amazing opportunity to boost sales we’ll go over our best tips for a successful Black Friday and Cyber Monday. Landing pages increase conversions, that’s a fact. A well designed landing page should showcase a specific product or group of products that are directly related to the Ad that your visitors clicked to reach your site. An optimized landing page would display the product, any promotions in a clear and readable font, a short description and a prominent click-to-action button. Don’t clutter the page with too much information. Your visitor clicked your Ad because they showed interest and they likely want to see the product, the offer and hopefully make a purchase. A good landing page will have ‘white space’ also referred to as ‘negative space’. This is just space on the page without content and the idea is to draw attention to your offer and call-to-action. Less clutter on a landing page improves readability, focus and a better user experience. If you fill the page with too much information your message won’t come across as prominently and can lead to information overload. Bold headers, simple descriptions with promotions clearly displayed are key components to a successful landing page. 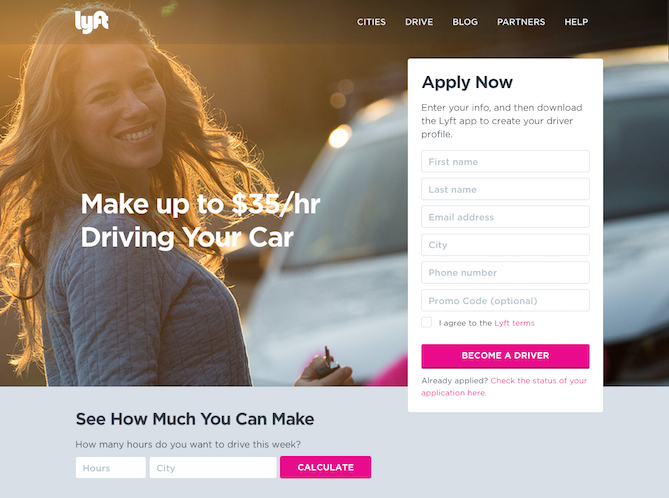 Lyft ride sharing landing page example. In the example above, Lyft has a clean top navigation, a simple form and a neat calculator to show you how much money you can make. They also have a good amount of white space and a click-to-action button which stands out visually. Here are some more landing page examples you can get ideas from to help you design the perfect landing page for your website. Once you’ve designed your landing page you’ll need to drive traffic to it. Social Media is the perfect ‘free’ way to do this. If your company has a blog then write up a post about your Black Friday and Cyber Monday offers. Make sure you add social share icons so readers can easily share your post on their social networks. Depending on the nature of your business, social media can do wonders! Even if you don’t have a large following it’s still good practice to share your offers because you never know who will convert to a sale. Plus, if you share your content and your offer is enticing your readers may share it within their social circles and that’s the idea, right!? Don’t forget to use hashtags! If you have an advertising budget then you should consider trying a platform like Perfect Audience. It’s super easy to use and allows you to advertise on Facebook, Instagram, Twitter and all across the web. You can create targeted audiences so you can reach the right viewers. If you signup for Perfect Audience you’ll also get $120 of free advertising credit to get your campaign off the ground. When people think of Black Friday and Cyber Monday they’re expecting to get a crazy deal. It’s been proven that offering a 10% or 20% discount doesn’t trigger a ‘buy’ signal with potential customers. This is your chance to offer an amazing deal that they can’t get any other time of the year. This applies to each business differently but the idea is to get the sale on the initial page visit. You have to consider your average cost per acquisition but factor in the value of that customer in the long term. If your margins are low then start with a 25% discount or even a monetary discount. If you’re taking the effort to promote your business on Black Friday and Cyber Monday then make sure the deal is of greater value. If you don’t want to knock down the price you can consider a BOGO offer (buy one get one free). Another option is to include a free gift with purchase or even free shipping. Over 88% of shoppers said that free shipping is the number one incentive considered when making an online purchase. Offering a free gift is a great way for brick-and-mortar stores to get foot traffic. You can even display the free gift near the front of the store with a sign. At HostUpon we use LiveChat to address support questions, billing inquiries and sales questions. It’s the perfect bridge between a visitor and helping them through the checkout process. With LiveChat you can also auto engage visitors with a quick greeting. This gives your visitors the confidence that someone is on the other end if they need any help. LiveChat also has an iOS and Android app so you can communicate from anywhere. You can even grow your subscriber list by asking customers for their email address before the chat with a consent box. 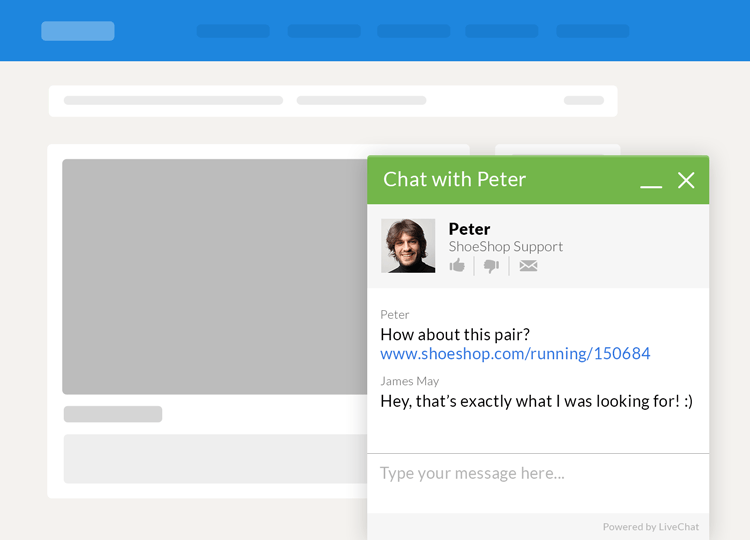 You can try LiveChat Free for 30 Days to see if it’s right for your business. People are more likely to click on your ad if it has an offer for these two special days. You should update your current campaign ads and freshen them up to show your targeted deals. It’s best to stick to 3 colors or less in your ads and try to stick to 2 font types. Your ads should coincide with your landing page so it’s a seamless transition to your website. I mentioned Perfect Audience earlier and they have a cool feature where you can create dynamic ads. 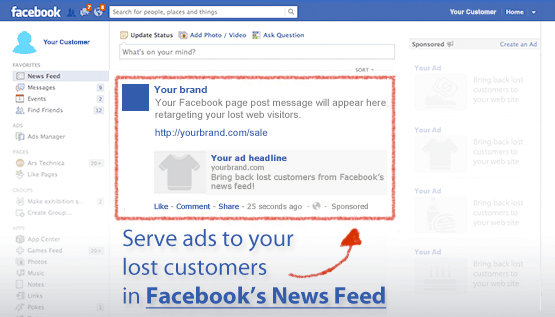 This allows you to display a product someone viewed on your website directly in the banner ad. For example, if someone looked at a red sweater on your site and didn’t complete the purchase you can now show them an ad with that red sweater and add a discount to sweeten the deal. This is one of the most effective ways to target and convert customers. If you don’t have an in-house graphic designer you can check out Canva.com. It’s a drag-and-drop design tool with thousands of templates and free images. You can create images for banners, social media posts, business cards and tons more. Canva is easy to use and requires no photo editing skills or Photoshop background. It’s one of our favorite design tools for making quick graphics to use across marketing campaigns. They have a free plan that you can get started with and paid plans for additional features. If you have a company blog you should write about your deals and can also include more detailed information since you’re not limited by copy space. People enjoy reading blogs so don’t make it a sales pitch. Write about what you offer, why they should purchase from you and what you can offer them that your competition can’t. Your existing customers are 80% more likely to re-purchase than a new customer. They have already gone through the order process and you’ve gained their trust. Sending tailored emails to your customers is a great way to increase conversions. 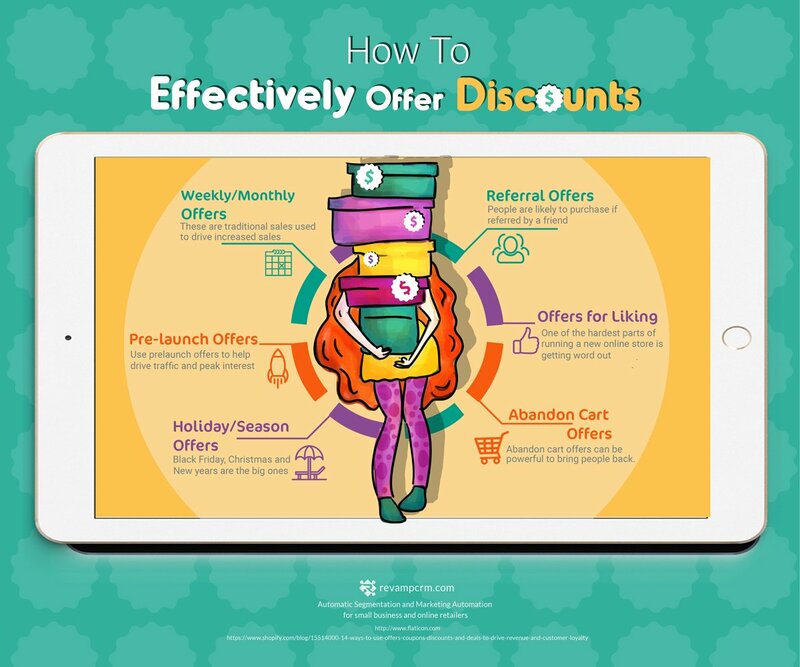 The best way to do this is by segmenting your customers in to smaller groups and then send these groups a tailored email with your offers and discounts. As an example, if you sell mens and womens clothing you should send a targeted email to each group individually as opposed to sending a generic email to both. You can segment these groups even further and by doing so your offers will be more relevant with a higher chance of converting. Email segmentation does take some time but doing it the right way can significantly improve sales. Don’t send too many, no one wants to be bombarded with emails. Tip: You can even offer a refer-a-friend deal which is a great way to have your existing customers spread the word about your business. This is a no brainer but make sure you proof read your work! If possible, ask someone else on your team to check the emails, landing page and marketing material. It never hurts to get a second opinion on your designs and wording. Also check that any coupon codes you mention in your marketing material work! Test them with different products so that your customers can apply the discounts with ease. You should also mention the expiry date of your offers so your customers know the coupon is only valid for a specific time period. If you use tracking links make sure they take your visitors to the correct landing page. 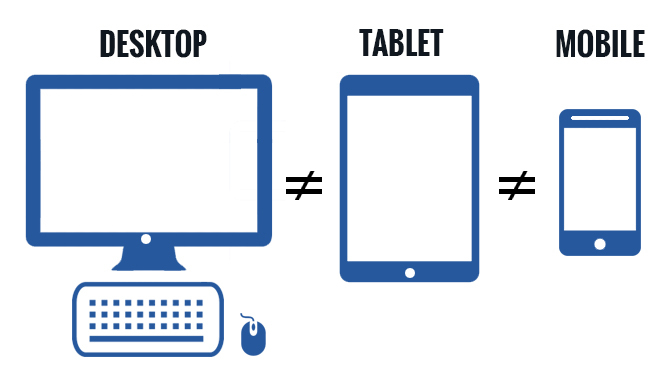 Approximately 60% of mobile and tablet users browse the web on their devices. If you advertise on Instagram then make sure your Black Friday and Cyber Monday banners are optimized for various screen sizes. If you’re sending out a marketing campaign email then services like MailChimp allow you to preview how your website would look on a mobile device. If you want to test how your website is displayed on various platforms you can use this free tool by mobiReady. As a web hosting provider, we recommend choosing a hosting plan that can handle an influx of traffic. You’ve spent time and money preparing your website but if your hosting plan can’t support the increase in traffic then you’re just going to end up with visitors leaving your website. Your web hosting plan is the backbone of your website. At HostUpon we offer 3 shared hosting plans and users can upgrade to a Cloud Server, VPS or their own Dedicated server. If you’re unsure whether your current hosting plan can support an increase in traffic we’re here to help! Speak with us on Live Chat or give us a call and we can discuss your options. Your web hosting plan plays an important role in the speed, performance and reliability of your online business. It’s easy to get excited in the hype but are you too focused on your own content? Scoping out what your competitors are offering for Black Friday and Cyber Monday is a great way to stay ahead of them. You may not have the same budget as your competition but that shouldn’t hold you back. Try offering a free gift with purchase, free expedited shipping, free returns and above all amazing customer service. Joining your competitors mailing list is also a great way to gain insight in to what offers and promotions they advertise. Knowing what your competition is offering gives you a leg up and you can get some valuable information as to how they market their products. With the holidays just around the corner now is the time to take things up a notch. These tips are not just for Black Friday and Cyber Monday so follow them year round. Growing your business takes time but your approach and preparedness will determine how successful you truly are.